The past few months have been busy for Leah! She’s learning so much every day – she’s curious and daring and into everything! 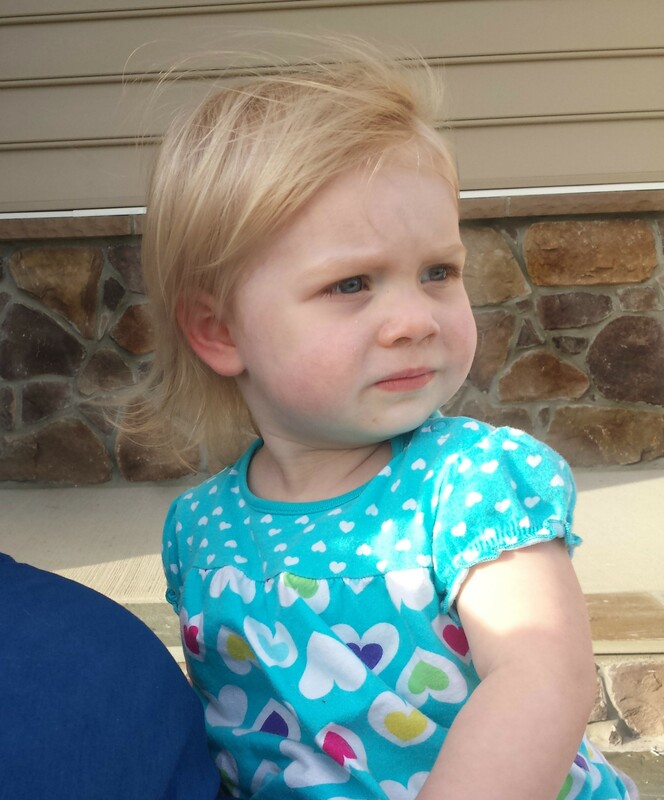 Talking, running, climbing, tantruming…everything you’d expect from a little girl staring down the upcoming terrible 2’s. Having been through the terrible 2’s once before and now having also been through the much worse 3’s, I’m thinking we can handle the 2’s again (hopefully). 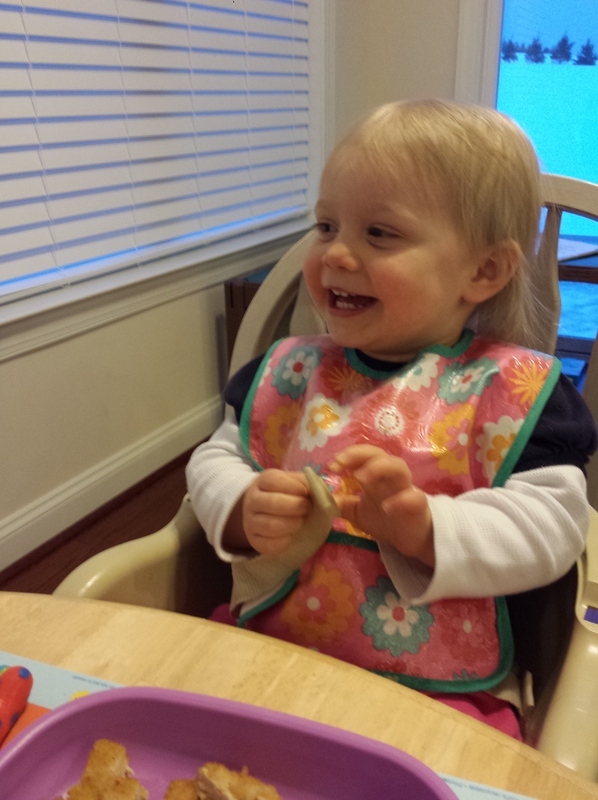 Why am I talking about the terrible 2’s at only 21 months? They start way before 2! Leah has really gotten into the tantrums in the past few months. We’ve definitely started time outs with her. It’s a little strange having to switch gears and go back to handling THIS type of tantrum. We’ve been getting used to the almost-4 year old tantrum (“I’m NEVER gonna listen to you!”) but now we need to go back to the almost-2 year old tantrum as well (all out hysterical screaming in a pitch that makes you wince and squeeze your eyes closed). So we’re back to trying as hard as we can to ignore the screaming while trying not to let her see us laughing at the ridiculous drama of these tantrums. So that’s the bad part about having an almost-2 year old, but there are so many more good parts about this age! It is definitely one of my favorite ages. Leah’s speech just keeps getting better and better! 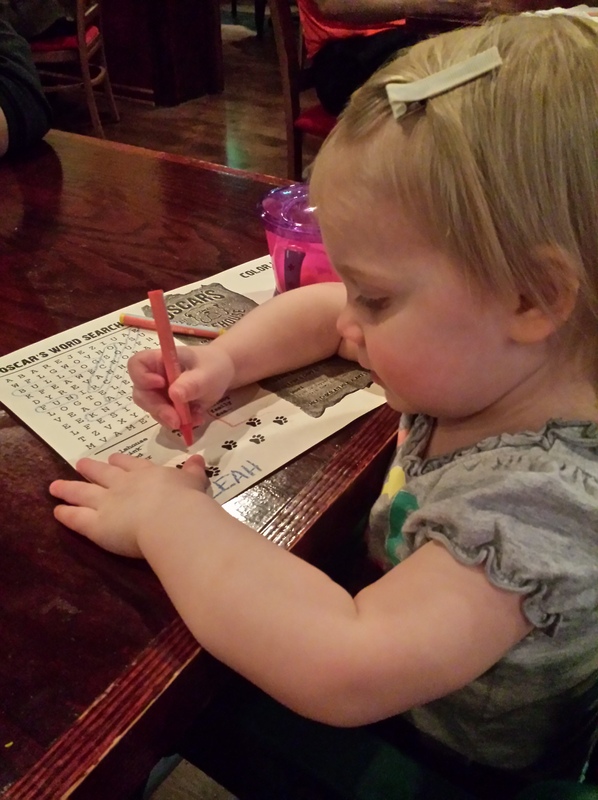 Between 18 and 19 months, she began putting 2 words together. She learned the words “my” and “mine” and she is always interested in pointing out what things belong to what people (“Daddy’s chair”, “Caelan’s water”, “Mommy’s jacket”, etc). Between 19 and 20 months, she started with these strings of babble that sounded like sentences except that we couldn’t really make them out. A lot of her words still don’t really sound like what they’re supposed to sound like, though we still recognize many of them in context. I long ago stopped counting her words, but she must have over 100 now. Some of her early words are starting to clear up. Originally, “waffle” and “water” were both “wawa” but now we have “wa-vel” and “wa-er”. 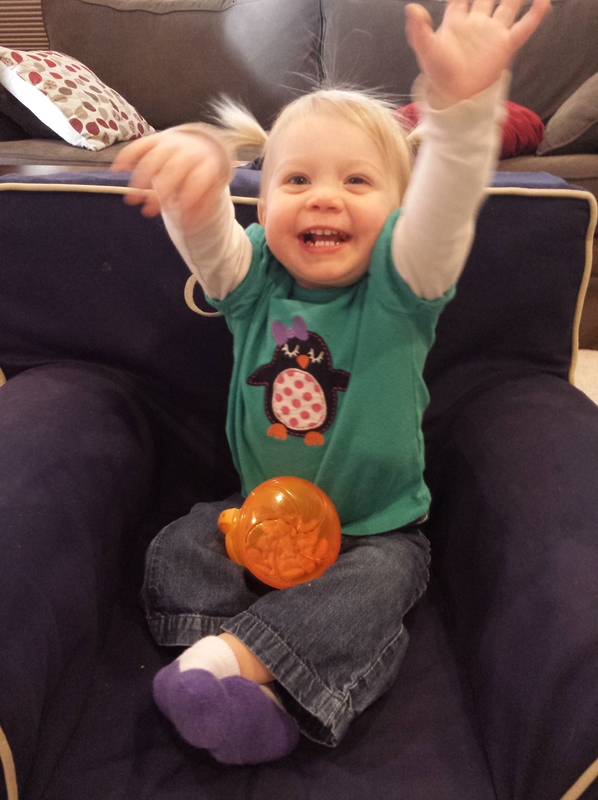 By 20 months she was regularly using 2-word and even 3-word phrases that we could understand! She is able to ask for what she wants and we are able to offer her choices. That doesn’t always work (especially when what she wants is NOT one of the choices) but we’re getting there. She is also starting to revise her word for Caelan. It started out as GaGa, but is now morphing into Kai-en, which is closer! As far as I know, Leah doesn’t know any letters or numbers. We kind of “forgot” to teach her those. Poor second child. Caelan was all about his letter/number/colors peg puzzles at this age, but he didn’t have an older sibling to play/fight with. It may be time to break out the magnetic letters and kill two birds with one stone – the alphabet for Leah and spelling for Caelan. Leah is starting to move out of her stranger-danger phase. She is still shy and usually quiet around people she doesn’t see all the time, but she is warming up. She’s taken a liking to the director at Caelan’s school and will even run to her to be picked up, but she still doesn’t speak around her other than to say “bye”. I keep assuring the director that she definitely does talk and I’m sure she’ll be an even better talker when she starts going to preschool herself in about 4 months! Both kids show signs of concern whenever the other one is upset and/or crying. They both try to comfort the upset sibling with shushing and hugs but usually get pushed away as the upset sibling is too upset to accept comfort. 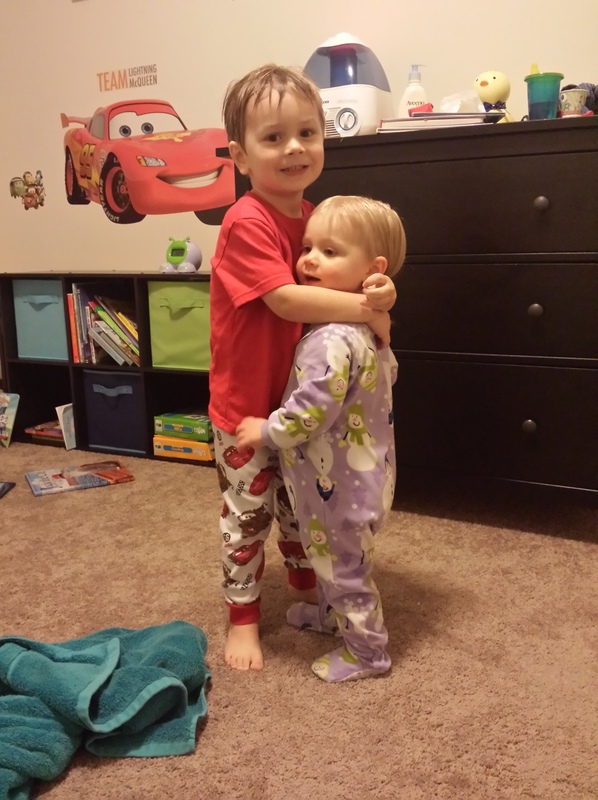 But when they’re both happy, they love to give hugs, especially at bedtime. They play reasonably well together. Of course there are fights and screaming and someone-took-someone’s-toy, etc etc etc, but that’s siblings for ya. They have also started to conspire against us, with Caelan leading the way and Leah more than happy to tag along. Leah’s sleep habits are…not great. She has dropped down to 1 nap per day, for the most part, which is good. Usually it’s after lunch, but sometimes she will crash earlier in the day. Putting her down is not usually a problem at all. Bedtime, also, is relatively easy (minus the fight Bill has with her to get her pajamas on) but she only sleeps through the night about half the time. The other half of the time, she wakes up 1-3x/night crying and we go in, she lies back down pretty much immediately, we recover her with a blanket, and that’s it. 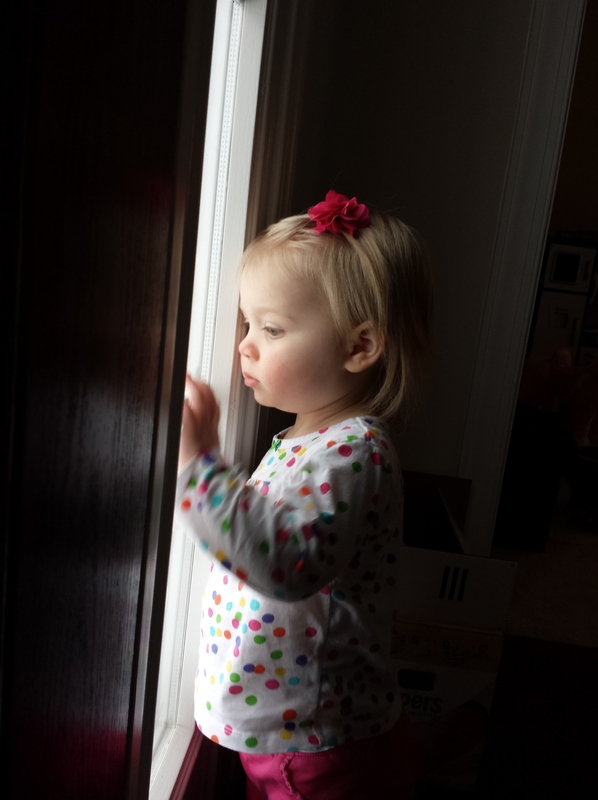 On the one hand, it’s nice that she (usually) goes right back to sleep, but on the other hand, she’s 21 months old! She should be able to go back to sleep without us going in there. Leah continues to be a big fan of books. If you have unlimited time and patience she will bring you book after book after book to read to her! 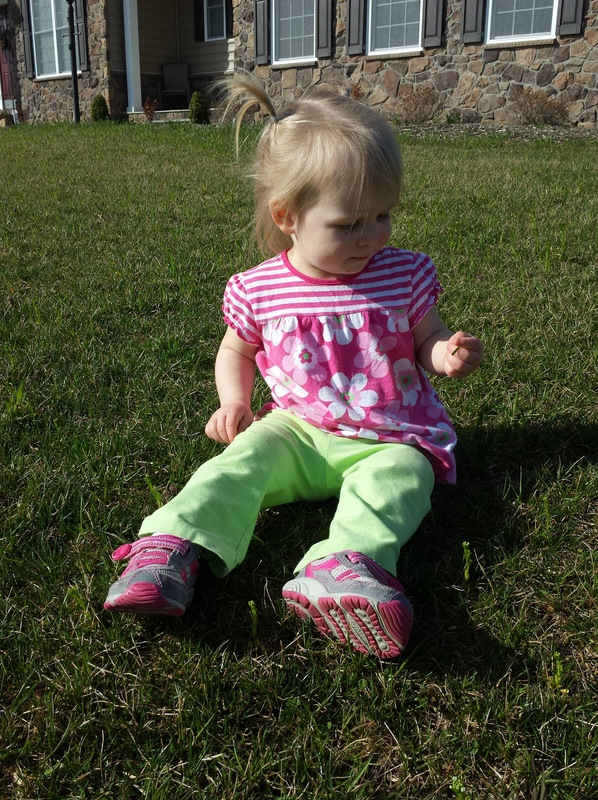 Her current favorites are “Purplicious” and a couple of nursery rhymes books. Leah also loves to color. Leah is great with self-care skills and she can be pretty independent. She can take off and put away her own shoes, she can put on shoes (depending on the shoe), she can put on her own jacket (she needs help with the zipper), and she is learning to take off her own clothes which she then puts in her laundry basket. 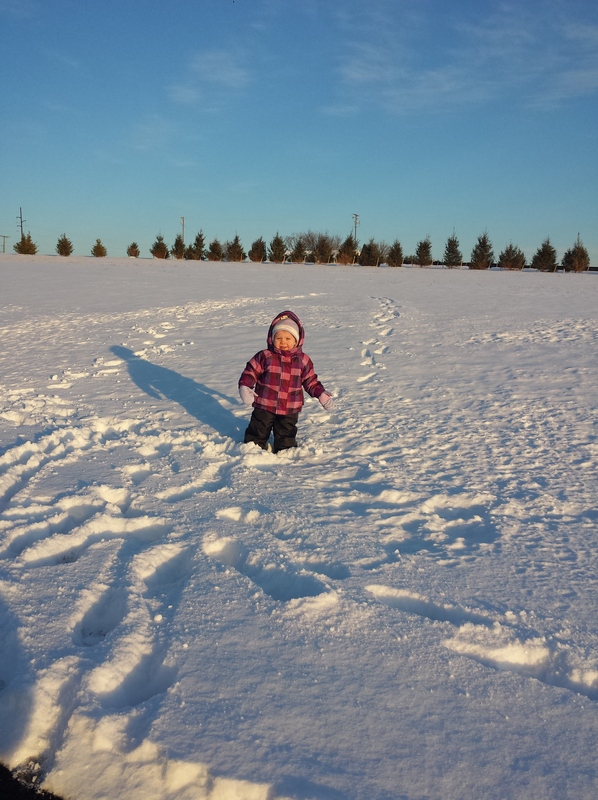 This seems like a long time ago now, but back in February, Leah got to play in the snow for the first time. I’m not sure how she felt about it. She didn’t hate it, but she wasn’t able to walk in 4+ inches of snow and falling that often was frustrating for her. 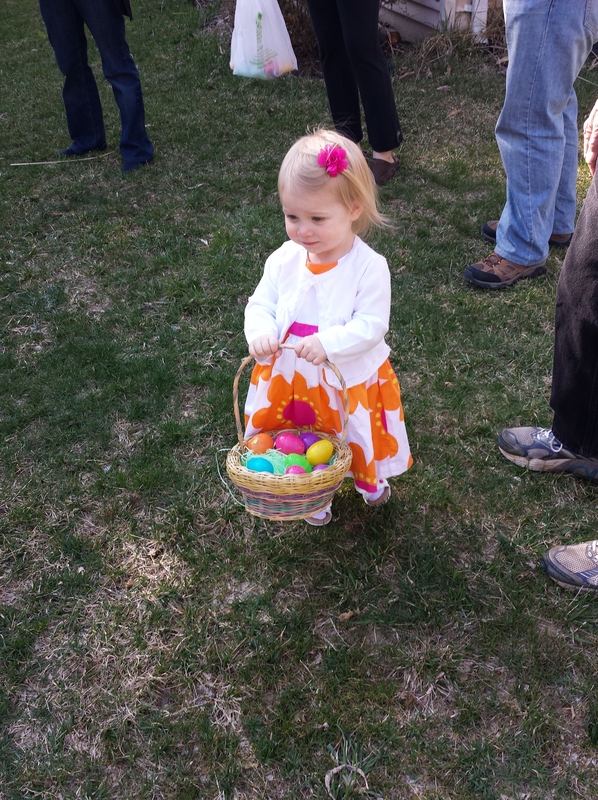 Leah’s 2nd Easter was a big hit! 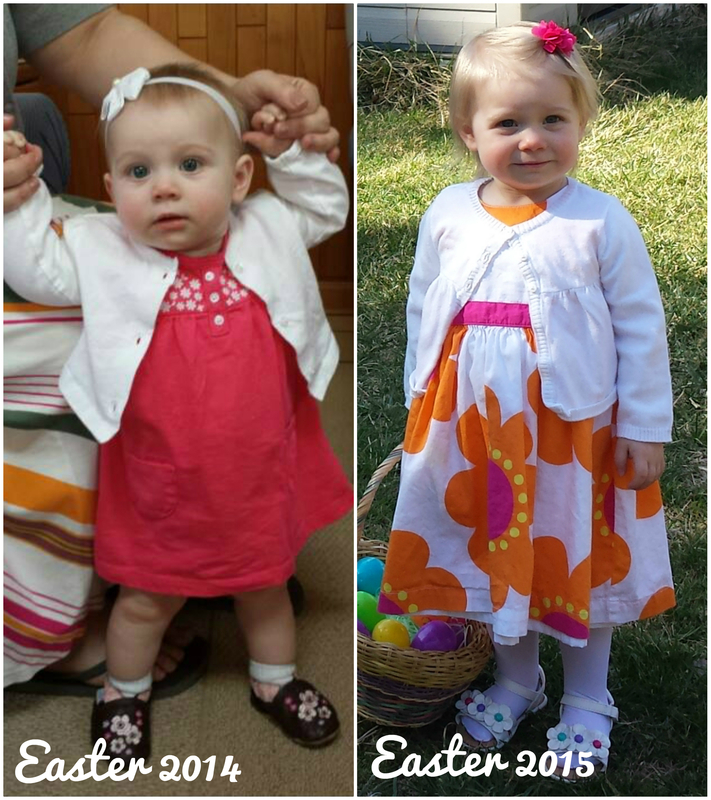 She looked so adorable in her dress and she had a great time hunting for eggs both at home and at Grandma and Pop’s house. We did take the kids to see the Easter Bunny this year. Leah seemed excited about it while we were waiting in line, but when she actually got up to the bunny, she panicked and ran away. Not unexpected really! 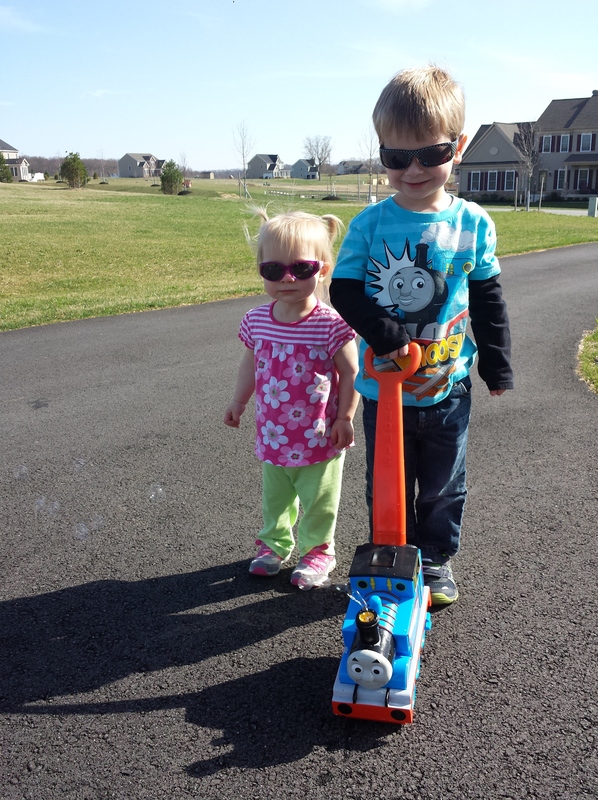 Since it’s finally been getting warmer, we’ve been able to play outside! 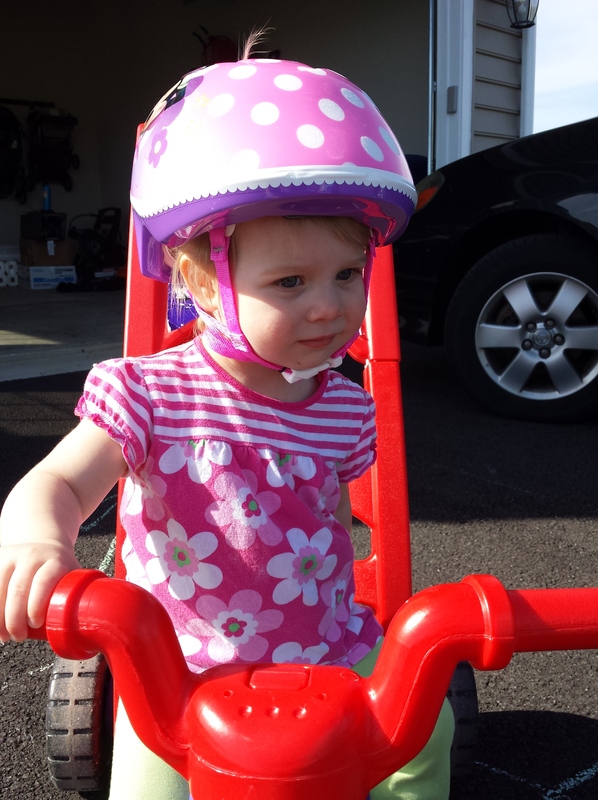 Leah loves to ride Caelan’s bike (which at this point is just us pushing her on it). She loves to color with chalk and run after Caelan. She also takes off down the driveway every chance she gets. The other day I got to be that mom yelling and running down the driveway after an escaped toddler while a sympathetic woman in a minivan stopped to wait for me to scoop Leah up. At least I’m getting exercise?! I’m really enjoying watching Leah turn into a real toddler right before my eyes. Her personality is coming out and though she definitely has a flair for the dramatic, she is also funny and silly and sweet. Hopefully we can nip the drama in the bud and it won’t get too out of control, but we’ll just have to see. I also hope that she’ll continue to come out of her shell a little more. She’s so talkative at home and not many other people get to see that side of her! You are currently browsing the Decorate This blog archives for May, 2015.